Michael Hurley is a litigation attorney for Pentiuk, Couvreur & Kobiljak, P.C. He has been practicing law in Michigan for over 20 years, where he has appeared in district and circuit courts throughout the state on behalf of individuals and corporate clients. In addition to handling a wide range of civil litigation cases, he has worked extensively in criminal law. Mr. Hurley worked 10 years in Dearborn handling public defense cases. He also served as the municipal prosecutor for the cities of Trenton and Belleville. Currently, he serves as the Prosecutor for the cities of Riverview, Wyandotte and Allen Park. He is responsible for the prosecution of municipal ordinance and misdemeanor cases within these cities. Mr. Hurley also practices real estate law, criminal law, civil litigation and municipal law. In these areas, he has tried hundreds of cases throughout his career. 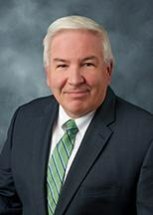 After receiving his bachelor's degree in History from Wayne State University in 1980, Mr. Hurley went on to graduate from Thomas Cooley Law School with distinction in 1984. He is a member of the State Bar of Michigan and the United States District Court Bar Association.